SYNOPSIS: The capital has fallen. The Darkling rules Ravka from his shadow throne. Alina will have to forge new alliances and put aside old rivalries as she and Mal race to find the last of Morozova’s amplifiers. But as she begins to unravel the Darkling’s secrets, she reveals a past that will forever alter her understanding of the bond they share and the power she wields. 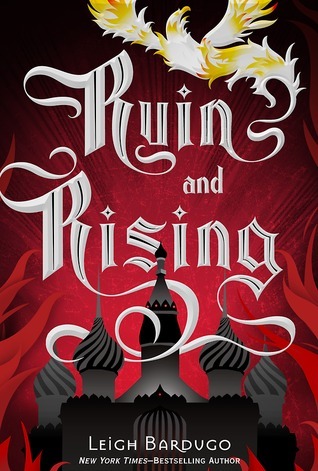 The firebird is the one thing that stands between Ravka and destruction–and claiming it could cost Alina the very future she’s fighting for. It’s been over a year since I first started this trilogy, and there were many times along the way where I thought I would never actually finish it, because—as you can see from my 3-star, less-than-stellar reviews of the first two installments—I wasn’t nearly as impressed by this series as I could’ve been. Leigh is a wonderful writer, but these books felt incredibly “debut” to me, and there were a lot of aspects I disliked, which is why it surprised me that I so thoroughly enjoyed the finale, but I can now safely say that I am very happy I saw things through to the end. While I was pleasantly surprised by many things in the finale, Alina’s character development was sadly not one of them. She was my second least favorite character in the first book, tied with Mal for my least favorite in the second book, and was hands-down, absolutely the least exciting and/or likeable thing about Ruin. I struggled so much with relating to her character because she self-contradicts so often. She is incessantly torn between the men in her life, and the one thing she desperately wants—power—is important enough that she is willing to risk the world for it, until suddenly, overnight, it no longer interests her. It didn’t feel believable or authentic in the slightest, and I found myself dying for the scene to end every time she was alone with her own thoughts. Mal, on the other hand, had quite the surprise in store for me. If, when I first began the series, anyone had told me I could actually grow to enjoy this character, I would’ve laughed, but here we are—finally, finally, there were moments with Mal that made me enjoy him as a character and believe in his intentions and desires. I can’t help but think that the change was triggered by the fact that he finally accepted who he was and what his hand in life was, and stopped trying to fit Alina into the box he’d created for her. By the end of the book, I was shocked to find that I was actually rooting for him a little bit, which I think is the biggest part of why this was my favorite book; the second half or so of Ruin showed me a clear line in which Leigh’s writing had progressed from “debut author” to the incredible woman and artist I view her as today. Sweet Nikolai—where would we be without our golden prince of Ravka? I adored him just as much in this installment as I did in Siege. Having come into this series a little bit late, and knowing his nickname as the King of Scars without knowing where the title came from, made it especially fascinating to watch the events that unfolded for Nikolai in the finale, and how they changed him as a person. I only thought I was excited for his book before, but now, I can’t stand my own anticipation! ❤ He was just as snarky, clever, brave, kind, and hilarious as always, and I would read his banter forever, truly. I have a lot of feelings about dear old Darkles, and I am honestly surprised at how many of them have shifted from my initial thoughts on him. I adored him in Shadow. While I couldn’t get behind his motives as much in Siege, I still loved him there, too. In this book, however—and this is going to be an unpopular opinion, I feel like, so please don’t hate me!—he did a lot of fairly irredeemable things, and worse than that, I couldn’t buy into him as a villain any longer. I felt like, rather than actually feeling emotions for him, I was being spoon-fed Alina’s ambivalent desires and pity for him. On top of that, it was impossible to reconcile her neverending chemistry with him, with the fact that he brutalized her home and the people she loved, witnessed her to absolute travesties, and used and manipulated her time and time again. I still want to dwell on the character that I loved and was so drawn to, but unfortunately, his characterization in the finale ruined a lot of his persona for me. Of course, this trilogy is notorious for its love triangle—er, sorry, love square?—and I was oddly somewhat impressed by how long it managed to keep the guessing game going, as Alina’s wishy-washy nature doesn’t lend well to, you know, making decisions and such. That said, I didn’t find myself rooting for any particular pairing until the very end of the book; I had issues with each ship, whether it was my disliking for Mal during the first two books, my insistence that Nikolai deserved way better than anything Alina could give him, or my growing disbelief in the chemistry between her and the Darkling. That said, the ending of this book pulls out the stops on the romance and finally made me root for one specific pairing, but honestly, at that point, it was a bit of “too little, too late”. While I love Leigh’s writing immensely, I’ve yet to be convinced that she’s able to write enjoyable romances, but I’m told by many, many people that I will change my tune on this pretty substantially once I pick up the Six of Crows duology! As always, the real stars of the show, for me, were the side characters—not just the “important” ones like Nikolai, but the minor roles that flitted in and out of the storyline, like Genya, Zoya, Baghra, and my personal favorites, Tolya and Tamar. There are just so many lovable people in this storyline, and honestly, at least six or seven of them could have novellas written about just their specific lives and I would pre-order the hell out of them and eat them right up. I can’t even tell you guys what I would give for a novella about Baghra, or an entire spin-off novel of Tolya and Tamar! Of course, the best/worst thing about how amazing Leigh is at scripting a supporting cast? The devastation that comes with any single one of them dying or being harmed in any way. I won’t spoil anything, but I felt more heartache over some of the minor characters in this finale than I had felt for Alina and Mal in the entire trilogy combined. This was what Ravka did. It made orphans. It made misery. T10T: Top Spring TBR Picks! I too, wasn’t a huge fan of this trilogy and Alina and Mal, but I enjoyed the finale. Nikolai and Genya were my two favorites! Nikolai and Genya were so precious! ❤ I honestly loved Genya's big moment with the King and everyone SO. MUCH. It made my heart swell when everyone stood up for her. Yesss, exactly, haha! It felt like a “means to an end” sort of thing – like, I didn’t LOVE the series, but I’m honestly really glad that it exists and that I read it, if that makes sense? I know EXACTLY what you mean, because that’s how I feel too!